When Elizabeth Cline emerged from a Kmart in the summer of 2009 with seven pairs of the same perishable $7 shoes, she knew America had a problem. In 1985, we bought roughly 31 clothing items per year; now we snap up twice that many thanks to “fast fashion.” (See “What Not to Wear” from our July/August 2012 issue.) 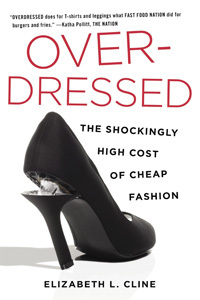 Cline explores the origins of this shift—think the Gap circa mid-1990s—as she tours cheap-chic factories in China and clothing “landfills” (charity stores) where the castoffs pile up. Best, Cline is never preachy; she uses her personal addiction to highlight our national one.